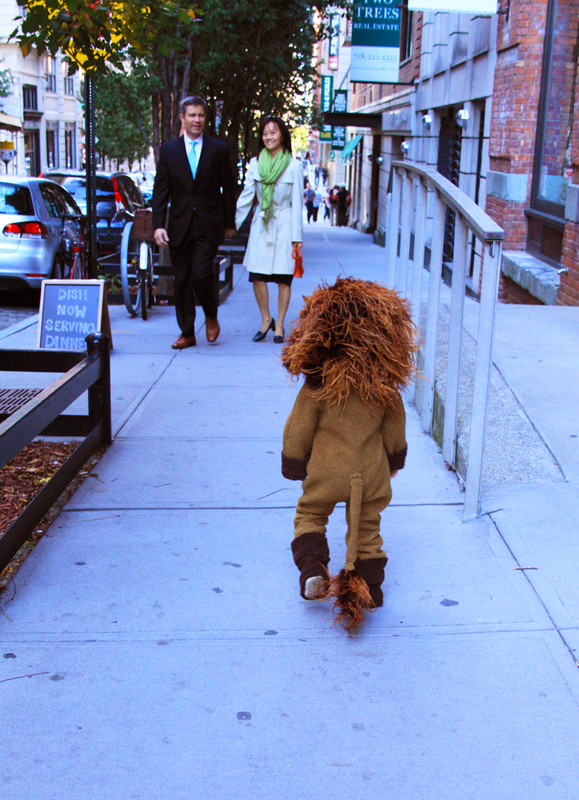 There have been reports in Brooklyn of a wild lion cub on the loose. The lion cub has been cute-erizing the residents of the neighborhood causing many to take its picture and post it to Instagram. Luckily, I shot a couple of photos of the lion cub before it took off down the sidewalk headed towards the Manhattan Bridge. 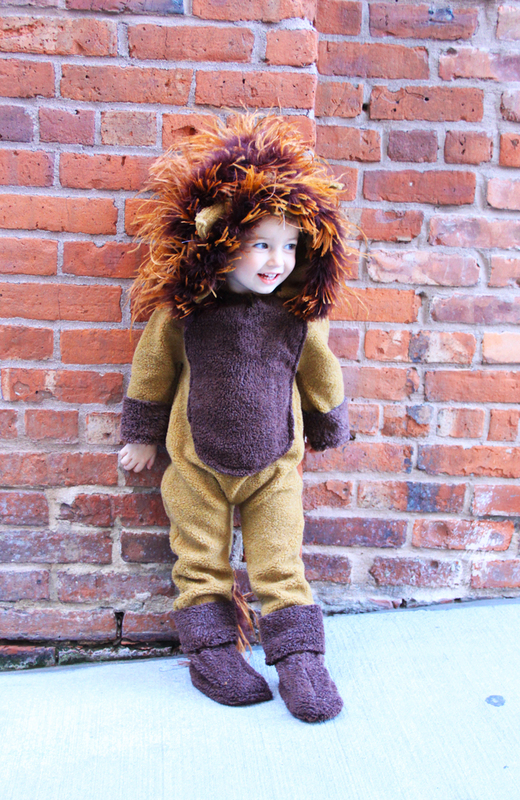 I made this adorable lion costume for my daughter to wear on Halloween. She is only 2 so I wanted to be sure that the costume I chose for her would be something that she would be excited to to wear on the big day. I'm not going to lie, it took a little coercion (a lolly pop bribe) to get her to put the lion costume on, but once she had it on she didn't want to take it off. Now she mentions the "lion costume" followed by the cutest little "Roar! 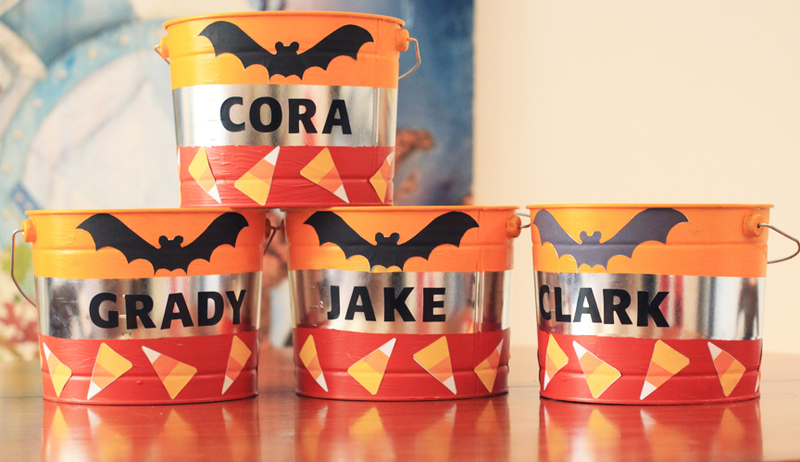 ", "Halloween" and , of course, "lolly pops" to me at least three times a day. 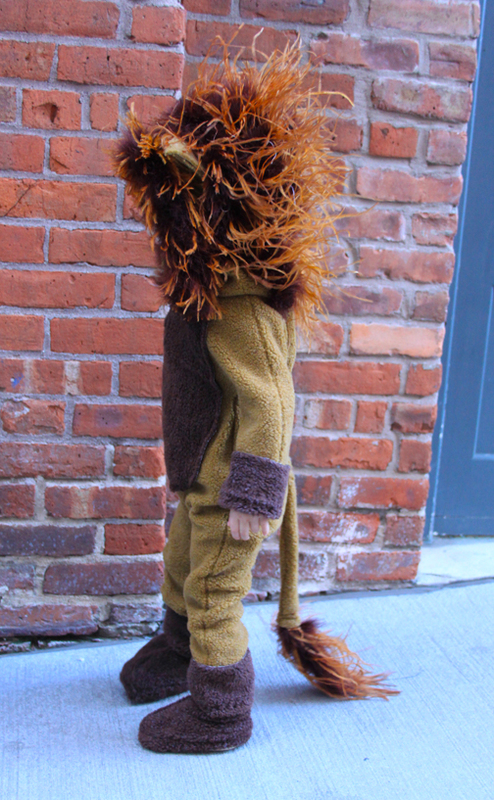 Follow my tutorial below to make the little person in your life into the most adorable/ ferocious lion roaming the wild sidewalks this Halloween. 3. Lay the body pattern, hood pattern and sleeve pattern onto the folded light brown fleece and cut out the front and back body pieces, two hood pieces, and two sleeve pieces. 4. Use tracing paper to draw the oval tummy, arm and leg cuffs from your pattern. Pin to the brown fleece and cut out one tummy, two arm cuffs and two leg cuffs. 6. So that you can get the neck over the head of your child, you will need to make a small slit in the front of the costume at the neckline. Cut a slit through the tummy oval and the body from the middle of the neckline down about 4-6 inches depending on the size of your child. Sew the tummy to the body sewing around the edge of the oval tummy piece and on either side of the slit. Sew in a zipper to the slit or velcro (I opted for velcro because it's easier to sew in and easier for a toddler to fasten by himself). 7. Sew the arm and leg cuffs onto the sleeves and pant legs. 8. Sew the top shoulder of the front and back of the bodices together. 9. Sew the hood together and attach it to the neckline. 10. Sew in the sleeves. 11. Place the two pieces of the body face to face (tummy on the inside) and pin them together. 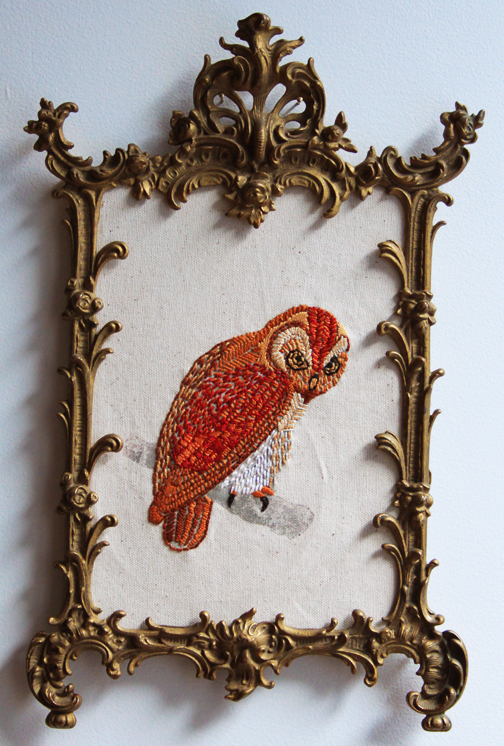 Then sew along the edges. Turn right side out. 12. Cut four triangles out, leaving about a half inch at the bottom of each triangle. This is how you will attach the ears to the top of the hood. 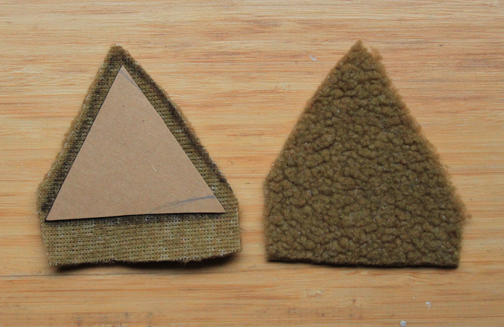 Cut a triangle out of cardboard and sandwich it between the two pieces of fleece. Sew around the edges, but leave the bottom flap open. 9. Sew the ears to the top of the hood. 10. Use ostrich feather boa to make the mane. I attached it to the hood with a needle and thread tacking it to the hood every 1/2 inch or so. 11. Use a cutting of the ostrich feather boa and a strip of fleece to make the tail. Sew the strip long ways inside out. Turn right side out. Stuff some of the boa into the hole and sew shut. Sew the other end to the body. Use your child's shoe or foot measurements to create the pattern.Add about 1/2 inch on all sides for seam allowance, 1-2 inches to the length on top and bottom for stretch and 1 inch to the top and bottom seam to allow room for the elastic. Face two shoe pieces together and sew the heel and toe. Lay flat and fold the top down 3/4 inch and sew. Fold the bottom up 3/4 inch and sew. Cut two pieces of elastic. One for the ankle and one for the bottom of the shoe. Use a safety pin to string the elastic through the folds. Sew the elastic together and finish the seam. Turn the shoe cover inside out and sew the other side together. Turn right side out.